Coat of arms of the Dauphin of France. Arms of the Dauphin of France, depicting the fleur-de-lis and the dolphin. Dauphin of France (French: Dauphin de France [dofɛ̃ də fʁɑ̃s]), originally Dauphin of Viennois (Dauphin de Viennois), was the title given to the heir apparent to the throne of France from 1350 to 1791 and 1824 to 1830. The word dauphin is French for dolphin. At first the heirs were granted the County of Viennois (Dauphiné) to rule, but eventually only the title was granted. Guigues IV, Count of Vienne, had a dolphin on his coat of arms and was nicknamed le Dauphin. The title of Dauphin de Viennois descended in his family until 1349, when Humbert II sold his seigneury, called the Dauphiné, to King Philippe VI on condition that the heir of France assume the title of le Dauphin. The wife of the Dauphin was known as la Dauphine. The first French prince called le Dauphin was Charles the Wise, later to become Charles V of France. The title was roughly equivalent to the English (thence British) Prince of Wales, the Scottish Duke of Rothesay, the Portuguese Prince of Brazil, the Brazilian Prince of Grão-Pará and the Spanish Prince of Asturias. The official style of a Dauphin of France, prior to 1461, was par la grâce de Dieu, dauphin de Viennois, comte de Valentinois et de Diois ("By the Grace of God, Dauphin of Viennois, Count of Valentinois and of Diois"). A Dauphin of France united the coat of arms of the Dauphiné, which featured Dolphins, with the French fleurs-de-lis, and might, where appropriate, further unite that with other arms (e.g. Francis, son of Francis I, was ruling Duke of Brittany, so united the arms of that province with the typical arms of a Dauphin; Francis II, while Dauphin, was also King of Scots by marriage to Mary I, and added the arms of the Kingdom of Scotland to those of the Dauphin). Originally the Dauphin was personally responsible for the rule of the Dauphiné, which was legally part of the Holy Roman Empire, and which the Emperors, in giving the rule of the province to the French heirs, had stipulated must never be united with France. Because of this, the Dauphiné suffered from anarchy in the 14th and 15th centuries, since the Dauphins were frequently minors or concerned with other matters. During his period as Dauphin, Louis, son of Charles VII, defied his father by remaining in the province longer than the King permitted and by engaging in personal politics more beneficial to the Dauphiné than to France. For example, he married Charlotte of Savoy against his father's wishes. Savoy was a traditional ally of the Dauphiné, and Louis wished to reaffirm that alliance to stamp out rebels and robbers in the province. Louis was driven out of the Dauphiné by Charles VII's soldiers in 1456, leaving the region to fall back into disorder. After his succession as Louis XI of France in 1461, Louis united the Dauphiné with France, bringing it under royal control. The title was automatically conferred upon the next heir apparent to the throne in the direct line upon birth, accession of the parent to the throne or death of the previous Dauphin, unlike the British title Prince of Wales, which has always been in the gift of the monarch. The sons of the King of France hold the style and rank of fils de France (son of France), while male-line grandsons hold the style and rank of petits-enfants de France (Grandson of France). The sons and grandsons of the Dauphin ranked higher than their cousins, being treated as the king's children and grandchildren respectively. The sons of the Dauphin, though grandsons of the king, are ranked as Sons of France, and the grandsons of the Dauphin ranked as Grandsons of France; other great-grandsons of the king ranked merely as Princes of the Blood. The title was abolished by the Constitution of 1791, which made France a constitutional monarchy. Under the constitution the heir-apparent to the throne (Dauphin Louis-Charles at that time) was restyled Prince Royal (a Prince of the Blood retitled prince français), taking effect from the inception of the Legislative Assembly on 1 October 1791. The title was restored in potentia under the Bourbon Restoration of Louis XVIII, but there would not be another Dauphin until after his death. With the accession of his brother Charles X, Charles' son and heir Louis-Antoine, Duke of Angoulême automatically became Dauphin. With the removal of the Bourbons the title fell into disuse, the heirs of Louis-Philippe being titled Prince Royal. After the death of Henri, comte de Chambord, Carlos, Duke of Madrid, the heir of the legitimist claimant, Juan, Count of Montizón, made use of the title in pretense, as have the Spanish legitimist claimants since. Arms of Dauphin François, Duke of Brittany. Arms of Dauphin Francis, King-consort of Scots. Heraldic Crown of the Dauphin of France. In Mark Twain's Adventures of Huckleberry Finn, Huck encounters two odd characters who turn out to be professional con men. One of them claims that he should be treated with deference, since he is "really" an impoverished English duke, and the other, not to be outdone, reveals that he is "really" the Dauphin ("Looey the Seventeen, son of Looey the Sixteen and Marry Antonet"). Is a character in Shakespeare's Henry V.
In Baronness Emma Orczy's Eldorado, the Scarlet Pimpernel rescues the Dauphin from prison and helps spirit him from France. Alphonse Daudet wrote a short story called "The Death of the Dauphin", about a young Dauphin who wants to stop Death from approaching him. It is also mentioned in Cormac McCarthy's Blood Meridian. "The Dauphin" is a 1988 episode of Star Trek: The Next Generation. As the titular character is female, the episode title gets the gender incorrect. ^ "dauphin | French political history". Retrieved 3 September 2016. ^ "Louis, Dauphin of France Biography". The Biography.com website. A&E Television Networks. 2 April 2014. Retrieved 3 September 2016. Louis Philippe I was King of the French from 1830 to 1848. His father Louis Philippe II, Duke of Orléans had taken the name "Philippe Égalité" because he initially supported the French Revolution. However, following the deposition and execution of his cousin King Louis XVI, Louis Philippe fled the country. His father denounced his actions and voted for his death, but was imprisoned and executed that same year. Louis Philippe spent the next 21 years in exile before returning during the Bourbon Restoration. He was proclaimed king in 1830 after his cousin Charles X was forced to abdicate by the July Revolution. The reign of Louis Philippe is known as the July Monarchy and was dominated by wealthy industrialists and bankers. He followed conservative policies, especially under the influence of French statesman François Guizot during the period 1840–48. He also promoted friendship with Britain and sponsored colonial expansion, notably the French conquest of Algeria. His popularity faded as economic conditions in France deteriorated in 1847, and he was forced to abdicate after the outbreak of the French Revolution of 1848. He lived out his life in exile in the United Kingdom. His supporters were known as Orléanists, as opposed to Legitimists who supported the main line of the House of Bourbon. Count of Paris was a title for the local magnate of the district around Paris in Carolingian times. After Hugh Capet was elected King of France in 987, the title merged into the crown and fell into disuse. However, it was later revived by the Orléanist pretenders to the French throne in an attempt to evoke the legacy of Capet and his dynasty. The Counts of Albon were members of the medieval nobility in what is now south-eastern France. Louis Antoine of France, Duke of Angoulême was the eldest son of Charles X of France and the last Dauphin of France from 1824 to 1830. He was technically King of France and Navarre for less than 20 minutes before he himself abdicated, due to his father's abdication during the July Revolution in 1830. He never reigned over the country, but after his father's death in 1836, he was the legitimist pretender as Louis XIX. 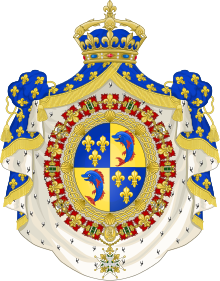 The 4th House of Orléans, sometimes called the House of Bourbon-Orléans to distinguish it, is the fourth holder of a surname previously used by several branches of the Royal House of France, all descended in the legitimate male line from the dynasty's founder, Hugh Capet. The house was founded by Philippe I, Duke of Orléans, younger son of king Louis XIII and younger brother of king Louis XIV, the "Sun King". The County of Valentinois was a fiefdom within Dauphiné Viennois and was a part of the Holy Roman Empire from 1032 until the sixteenth century. Count of Diois is a title of nobility, originally in French peerage. 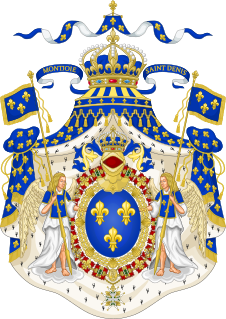 It was created in 1350 inside Dauphine of Viennois Patrimony by Philip VI of France when Humbert II of Viennois sold his lands and titles to King Philip VI of France. All patrimony of Dauphine consisted in: Count of Albon, Grésivaudan, Briançonnais, Grenoble, Oisans, Briançon, Embrun and Gaph, Baron de La Tour du Pin, Dauphin of Viennois, count of Valentinois, and given to Cesar Borgia join to Duke of Valentinois by Louis XII of France.